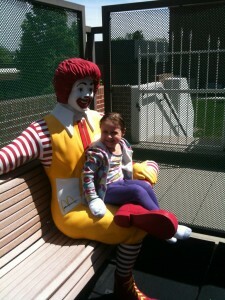 Bella on the Ronald McDonald Playground attached to the playroom. Only hands and feet are wet wrapped now. Bella slept really well last night! She sat up once around 3:00 AM. I told her everything is OK, and she settled herself back to sleep. I had to wake her up to get her to the hospital on time. Pulling her wet wraps off this morning was like opening a present. Her skin looks amazing! Most of her body feels like a baby’s bottom. Her skin has never felt like this. Her hands and feet (always her worse parts) are still slightly inflamed and kind of rough. We went straight to radiology for an upper GI. If you know Bella in real life, you know her voice sounds raspy and a little hoarse. People have always told me it’s cute, but the doctors are concerned that it is a result of hidden reflux. The radiologists asked Bella to lie down on a table and drink a barium concoction while they watch it go down. She sat on the table but would not lie down. The two men told us to come back later. Once in the pediatric ward, she had her vitals taken. A team of doctors came to look at her skin and go over test results with me. They were very pleased with her skin. They said she needs two baths again today, but this time she only needs to wet wrap her hands and feet. The rest of her body no longer needs steroid creams. We will liberally cover it with Vanicream instead. Bella was thrilled! They also reduced the amount of sleeping medicine (Chloral Hydrate) she will take tonight. The doctors showed me a neat chart comparing the results of the allergy scratch test, blood test and life experience that I reported. Comparing the results, they said that peanut was definitely going to cause a reaction. There is no way to know how severe, so we need to carry an epi-pen. The hazelnut and cashew (pistachio too because so similar to cashew) should be avoided. Generally small children who are allergic to nuts are advised to avoid all tree nuts, because they don’t know how to tell them apart. The doctors said we could test other nuts if I felt it would not confuse Bella. I told them the only nut I was really interested in is almond. We love almond butter, and I’d love to be able to bake with almond flour. They said that it would work well to tell her the only nut you can eat is almond butter. They ordered a scratch test and blood test (reuse previous blood) to almond. The egg and dairy were interesting. Even though the scratch test showed practically nothing, the blood test showed a significant reaction. The decision was made to “puddle test” them. A puddle test is when they use actual egg and dairy instead of the serum in a scratch test. If the puddle test goes well, we will do a food challenge. Bella has never tested positive to wheat. It was suggested by someone we were working with to try removing it, so we did. When I added it back in, I was sure her eczema got worse the next day. So she has been wheat-free for a year or two. Since she tested negative on both tests here, the doctors want to do a food challenge. A food challenge is when the child is given a suspected allergen under doctor supervision. It is the only way to tell if there is a true allergy to the food. They asked if there were any other foods I’d like to test. General “fish” passed the scratch test, but we decided to test salmon, tuna and cod. I didn’t mess with shellfish since we are rarely around it. The doctors ordered a nasal flush once a day. I find this so interesting. We know that these eczema kids are prone to having staph on their rash. The staph irritates the rash and can cause infection. We also know that the nose is a huge breeding ground for all kinds of bacteria including staph. Kids pick, wipe or scratch their nose and then scratch their eczema spreading the germs. If you can get rid of staph in the nose, you can greatly reduce the amount of staph on the skin. Nasal flushes are also beneficial to asthma kids, but that is another article! After the doctors left, it was time for Bella’s bath and wraps. Once wrapped, she played in the playroom a little while, and then she and I ate lunch in her special friend’s room. It’s been so great getting to know this kid and her mom. Bella’s friend has some other conditions including pretty severe asthma (50% of kids with chronic atopic dermatitis develop asthma). Her mom is a single mom, and I think she deserves a gold medal! I can’t imagine going through what we’ve been through plus some alone. After lunch we had another scratch test. This time we did an environmental allergy panel. We added almond and the egg and dairy puddle test. Bella was pretty brave. I was proud of her. Then we met with the sleep doctor. Everyone here is amazed that we were able to get an appointment with her. She interviewed us for about an hour. She asked what I knew about night terrors. I told her only that my doctor said it was caused by anxiety and common in children with chronic pain. I didn’t mention that he said the next level of medication for night terrors is Prozac. She shook her head and said night terrors are NOT caused by anxiety. There is a genetic component to them. Night terrors, sleep walking, sleep talking are all different forms of the same thing. She asked if anyone in my family did these things. I told her my brother used to sleep walk. She jokingly said blame the night terrors on your brother! The doctor explained that we all have sleep cycles that we loop through. At the end of each sleep cycle, we wake up. We just don’t remember it. Night terrors/sleep walking/ sleep talking are the child getting stuck in the transition from one sleep cycle to the next. The only thing that triggers them or makes them worse is not getting enough sleep. Itching wakes up eczema kids over and over which means they are not getting enough sleep thus triggering night terrors in those who have a genetic predisposition. This is where anxiety can play a part. If a child is too anxious to go to sleep, then he/she will not get enough sleep and trigger night terrors. She said stopping the itching will likely get rid of or at least diminish the night terrors. She noted that we are taking care of that here. She recommended trying to get Bella in bed 15-30 minutes earlier to give her a little more sleep. She said she would definitely stick with the clonodine as long as we need to. She doesn’t recommend it often, but sometimes eczema kids need it. She feels it is perfectly safe for long term use. She said we need to be more consistent about giving Bella the medicine 30-60 minutes before sleep. Did I mention how refreshing it is that people get it here? As you know, we have to stay with Bella as she falls asleep to stop her from hurting herself. Also, she climbs in our bed in the middle of the night, so I can rub her itchy spots. I was sure I was going to get a lecture about these terrible sleep habits. To my surprise, the doctor said she wouldn’t expect anything different; we have done exactly what we needed to do. As the itching stops, we can gradually work on not staying in the room as she falls asleep, but we can’t do that ’till the itching stops. As the going to bed process becomes less dependent on Dad and me, the coming in our room should become later and later until she no longer comes in. The doctor sent me out with a bunch of literature that I can’t wait to read. After meeting with the sleep doctor, Bella went to the playroom while I went to an hour long class on atopic dermatitis. I took four pages of notes that I don’t have the energy to type up now. If you are interested, remind me later when I’m not so exhausted and I’ll share them. After the class, Bella had a nasal flush. The poor thing developed a nasty cold when we got here, so I was so glad they were helping her out. It took two nurses, but overall it went pretty smoothly. I was really proud of her. She earned another trip to the prize closet today. She picked out a teddy bear. wow, it sounds like you are ina haven for those with allergies!! Drs who get it?! How refreshing is that?!! And to be getting some answers, oh the relief you must feel!! So excited for you and your family nancy! Sounds like she is well on the road to recovery! God bless and keep you. It sounds like you are learning so much – at least I know I’ve learned a lot just from your notes. So interesting about the nasal flush and the night terrors. Also sounds like Bella is making good progress! How exciting!